A little piece of me: Who cares? The mumborg is finally feeling better, the IV antibiotics were producing a toxic effect, so she needed some anti sickness injections to stop those chundery feelings. The vacuum closure system has also been playing up, so the district nurse visits have been a bit longer, with dressing changes and extra injections. I have to say, that the district nurses have been really fantastic, super efficient and friendly. I don't know what happened last time we needed them, but it was not as pleasant. The black sponge you can see in the image above acts as a plug and makes sure no gunk escapes back into the wound. The tube you can see, takes the gunk to the machine seen in this post Blood and Gunk. 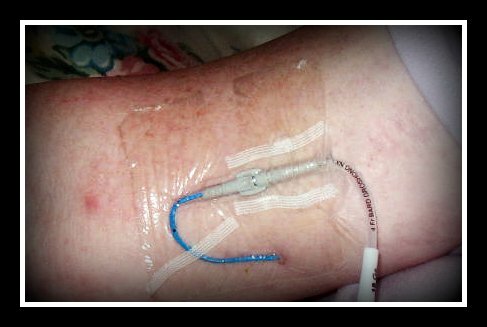 The image below shows the PICC line, which is used for the IV antibiotics. The mumborg has informed me that I should inform the world that she now has to take 70 tablets daily, as well all the injections and IV stuff. (she also has become demanding about taking pictures of this wee little cut of hers, sheesh). 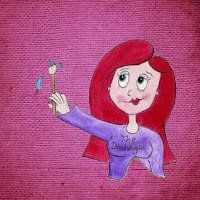 I decided it was about time I found out what support was out there for me 'The Carer', because it has become very apparent that if you don't look yourself, nobody is actually going to do anything for you. After a frustrating few hours of trying to find the phone number of the local carers centre, I eventually sent off a random email in the hope that it would reach the right person, it did! It turned out that there is no actual centre in my town any more, but a centre in the next town covers my area and a whole lot more. The Princess Royal Trust for Carers has took over the centre and has secured funding for three years, which is great news! More info about them can be found here The Princess Royal Trust for Carer's . What does a Carer's centre do? Well firstly they offer you drink and are really nice, well these ladies certainly were. I was already a bit flustered, as I had walked past the ruddy place three times, due to being a buffoon (heh). I am sure it was hidden from me at first, or I could just be a bit dim...(no need to answer that). So to be met by such nice folks was just lovely. After I briefly explained my reasons for being there, which were 'I'm a carer' and 'I have no idea', I was sat down with a form and then one of the ladies sat with me and we went through it together. It was basically all about who you look after, what you do, how you feel and what you need help with. Once they have a better idea of your situation, then they can dish out the right advice. At the moment, I need help with career advice and financial assistance for further training, so I was supplied with some great information and phone numbers. I will blog about that more after I have spoken to the folks in question, sometime this week. It sounds really promising though and it could be just what I needed help with. As well as benefit advice, it was also decided I needed some pampering, woot! So on Thursday I get to have my hair done and on Friday I am getting a facial and holistic massage, all free! That is just a small sample of the advice and help they have to offer, now they have my contact details, they will check in on me every couple of weeks and keep me updated with any information relevant to my situation. If you are a carer in the UK, I would strongly urge you to check out your local carers centre, even if you just want someone to chat to, Do it! Also check out Carer's UK. 70 tablets daily. WOW! I can hardly remember to take my single vitamin. I can only imagine trying to remember to take that many pills! Wow ! Thank you for the update and the unnecessary details about the Mum. Based on Jaffer's comments I'll forgo the photos, lol. Wow that wound is looking a lot better than the last photo (or is that just me?) 70 tablets is a LOT of tablets! Does she have time to do anything else?! Really glad you are getting some tlc, sounds very well deserved. I'm very glad to hear you're getting support and that your mom is feeling better! Holy crap I'm glad you're getting a bit of pampering, and also (of course) that your mums hurty bits are improving. Enjoy the pampering. Do we finally get a full face picture of you in all your glory once your hair is done? It is important to make sure you seek some care for yourself. It sounds like you found some. I'm very glad for that as caregiving can be (pardon the word choice) draining. You are such a good daughter. OT your comments did show, it's just a bit slow lately...what did you want to say??! Thank God everything is all right now - especially with a girl so brave!